Knollwood Phase 1. 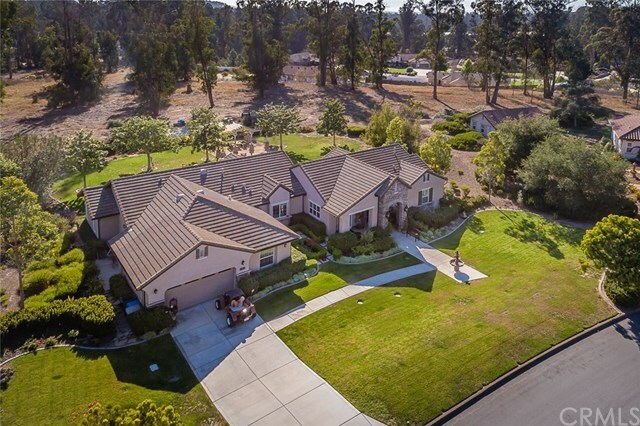 Beautiful single level 3425 square foot home on a premium acre+ lot in one of the Nipomoâs most desirable neighborhoods. Located centrally to Black Lake Golf Course and Trilogy Resort-this sprawling 3 bedroomâ4 bath home also has a large game room and office which can be used as additional bedrooms. All bedrooms have baths attached- master suite includes large master bath with 2 walk ins, travertine tile, spa tub and shower. Enjoy the private outdoor setting surrounded by beautiful landscaping, woods and open space. This home boasts an expansive open floor plan which lends itself to easy entertaining. The well-appointed gourmet kitchen includes composite counter tops, custom cabinets with large sink island, six burner gas stove top, double ovens, sub-zero wine cooler and wine bar and all that you would expect from a home of this caliber. Surround Sound in all rooms, dual zoned heating and air conditioning, 10 foot ceilings as-well-as 8 foot doors and low HOA fees of $110 per month. Homes in Knollwood Estates are each situated on approximately one acre-affording privacy and distance from neighbors. Community shares a park and trails in common. Spend your HOA savings on green fees or spa membership elsewhere-you will be ahead of the game. The drive to Trilogy Golf Course is 2.3 miles, Black Lake Golf Course is 1.3 miles and Cypress Ridge is 7.8 miles. Knollwood at Black Lake is off Willow Road and Dawn Road-Call your Realtor today for private showing. Directions: 101 to Willow-West to Black Lake Canyon RD-Left to American-Right. Home on Left.